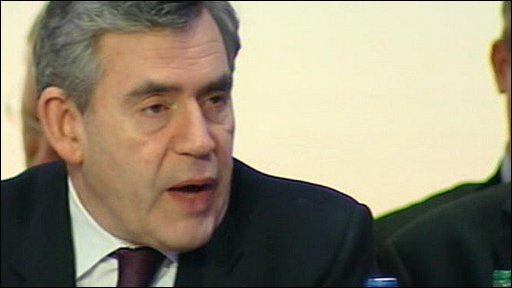 Gordon Brown has been criticised by the head of Opec for warning about the danger of volatile oil prices and told that he is "confused" about the issue. In a speech in London, Mr Brown said "wild fluctuations" in prices in recent years had damaged the global economy. Prices have tumbled from a record high of close to $150 a barrel in July to below $40, the lowest level since 2004. 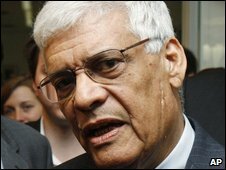 But Abdalla Salem El-Badri of oil producers body Opec said the PM should focus more on cutting UK petrol taxes. Mr El-Badri, Opec's secretary general, told the BBC the UK had benefited more than most countries from high oil prices because its taxes on petrol and oil extraction were the "highest in Europe". "Instead of looking at Opec he should look at his policies and try to reduce taxes," he told the World at One. "Then he can talk to us." Mr Brown angered many within Opec, whose members account for 40% of global oil production, in October when he said it was "scandalous" it was thinking of cutting output to stabilise prices. Mr Brown has also questioned the amount of power that Opec can wield over price movements. Prices have slumped in recent months as the severity of the global economic downturn has become clear, particularly in the US. Earlier this week, Opec voted to cut production quotas again. At a meeting of oil ministers in London arranged by Mr Brown, the prime minister said oil producing and consuming nations must work closer together to try and stem the volatility of recent years. Despite the recent price fall, Mr Brown said there was still a threat of them rising sharply again once the economy recovered and it was in everyone's interest to have a more stable price. "It is clear that our most pressing challenge is price volatility," he said. "Wild fluctuations in prices harm nations all around the world." But Mr El-Badri said Mr Brown needed to look closer to home for the reasons behind the price spike of recent years. "I think Mr Brown is very confused. If he is looking out for the interests of his people he should look at the taxes. "I advise that he should really look at these high taxes." He also denied Opec was too powerful and put the interests of its own members ahead of the wider needs of the global economy, stressing Opec had raised output considerably over the past year. "I assure Mr Brown we are trying to protect our citizens and trying to protect the market." Mr Brown's comments were also criticised by the Lib Dems who said that "instead of lecturing the world, what Mr Brown should be doing is moving the UK away from its crippling dependency on oil". Responding to the criticism, Energy Secretary Ed Miliband said he recognised that different countries had different views over what they considered a reasonable price for oil. But he said all countries "share an interest in preventing the kind of volatility we have seen over past couple of years in oil prices". He added: "The world has an interest in low oil prices. The fact that price have come down at time of recessions across the world is important because it is a way injecting demand into the economy." Experts are concerned that falling prices, combined with the economic downturn, will discourage oil companies from investing in new sources of oil needed to meet future demand. This could force prices as high as $200 a barrel in the long term, some argue, as demand for oil outstrips supply. One analyst said the price swings of the past year were more extreme than anything seen in the past 30 years. "There is so much speculation and uncertainty in the market that is creating volatility," said Fadel Gheit, chief energy analyst at the investment bank Oppenheimer & Co. 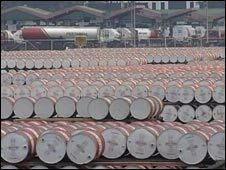 Ideally, prices should trade between a range of $45 to $65 a barrel, he said, but finding such a "middle ground" looked highly unlikely at the moment. "No-one believes in Opec or governments to regulate financial markets. It is almost a free for all." Mr Brown offered to stage the meeting - a follow-up to July's gathering of oil ministers in Saudi Arabia - when prices were seen to be at critically high levels close to $150 a barrel. The PM said the high oil prices of recent years had stoked inflation and forced governments to keep interest rates much higher than would have otherwise been the case. He urged wealthy oil-producing Gulf nations to invest more in areas such as carbon capture, as a way of diversifying beyond oil. At the same meeting, Saudi oil minister Ali Naimi said countries around the world needed to work together to ensure energy supplies remained "secure and reasonably priced". What's it like being a trader?